Sweetly B Squared: Going Up! Well, isn't that just the slickest thing? I remember when we were first looking for the house we've now lived in for four years. Hubby's biggest requirement was that it must have a three-car-garage. I don't even know when the plan entered his mind to turn our three-car-garage into a FOUR-car-garage. 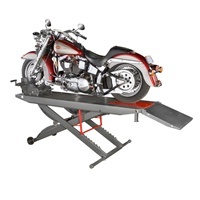 Do motorcycle lifts have the same options as car lifts? When hubby got our lift, he discussed whether to get the permanent lift or the portable one. I believe we got the portable one, but it still bolts into the concrete of the garage floor. Hope he never asks me to try and move that! As similar in function as a motorcycle lift appears to a car lift, I bet it has to be more secured onto the lift. From the picture, it looks like that's what the thing around the front wheel is doing. It also appears that most of them don't need to lift as high. Not having seen someone working on a motorcycle, I picture it as being a little more from the side than straight underneath. The spare car in our garage is lifted til the top is at the ceiling - with the convertible top of the car down. Dads still looking for a way to transport our motorcycle.